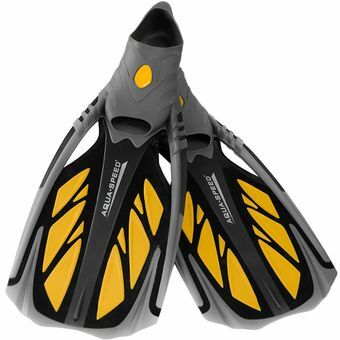 Modern, comfortable, flexible fins for snorkeling and easy, recreational dives. Ideally suited for bare feet. They have holes to reduce the load on the pen fins during acceleration. Accordingly, the molded fin agent causes the formation of a tunnel flow diverter water to the rear which increases the same thrust, speed of flow and reduced leg fatigue.